Ivanka Trump's unique role in the White House raised ethics questions with some lawmakers. Before she became a federal employee in late March, Ivanka Trump already had a White House office, security clearance and government-issued communications devices. And it raised ethics concerns. "Even though she's not a federal employee, she'll follow the restrictions that would apply if she were. She's taking these steps with advice of counsel and in consultation with the Office of Government Ethics," White House Press Secretary Sean Spicer said of Ivanka Trump on March 21. But the White House didn't consult the Office of Government Ethics, at least according to the office's director. That revelation comes in the form of a letter from director Walter M. Shaub Jr. to Democratic Sens. Elizabeth Warren and Tom Carper. It was in response to a request the senators sent in March. They wanted to know what rules Ivanka Trump would voluntarily follow and how the Office of Government Ethics would make sure she was complying. In his response to the request, Schaub said he reached out to Ivanka Trump's lawyer and the White House's ethics official on March 24 — three days after Spicer said Shaub's office had been consulted. Shaub said he expressed his office's "view that Ms. Trump appeared to meet the legal standard to be considered an employee covered by the executive branch ethics rules." And he said both the people he contacted "seemed open to the possibility of recognizing" her as an official employee. 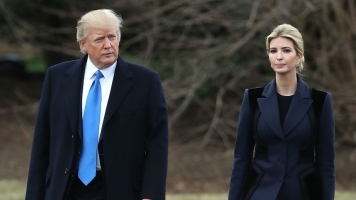 Five days later, Ivanka Trump became an unpaid federal employee, serving as assistant to the president. Since Ivanka Trump is now an executive branch employee, Shaub said she'll need to file both entrant and periodic financial disclosure reports. The entrant financial disclosure document was due at the end of April, but the White House can grant as much as a 45-day extension. White House ethics officials will review the reports for any conflicts of interest and work with Ivanka Trump to remedy any that may arise. Once that's complete, the Office of Government Ethics then reviews the disclosure. She also can't participate in "particular matters that would directly and predictably" affect her "financial interests" — which would include Trump family businesses and any other companies she has an ownership stake in. There are a number of ways she can avoid conflicts of interest: She can recuse herself from certain matters, divest of her stakes in companies or create a blind trust.